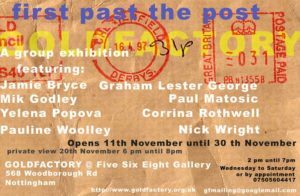 First Past the Post is a carefully chosen selection of works from GF artists and some who are new to GF. Following the closure of the project space several artists who were scheduled to develop new projects with us had to be informed that this was no longer possible. GF has now been able to make amends by including them in this show. This is the first exhibition in this new space which opens on November 11th it is anticipated that throughout the exhibition period new work will arrive at the gallery and replace the existing work (or in a more hopeful manner replace the work that has been sold). At the end of this exhibition much of the work will be taken to Bank Street Arts in Sheffield and be shown as part of the Big Hang. GF has a developing relationship with Bank Street Arts which we hope will flourish over the forthcoming year. Goldfactory has been looking at numerous new possibilities for development in particular international projects with a gallery in Berlin and an exchange programme with an arts collective in Sao Paulo in Brazil. Goldfactory, Proudly powered by WordPress.